Having the right camping chair while spending time sitting outside relaxing, enjoying a cozy fire or just visiting with friends, makes all the difference while RV'ing. As such, you’ll need to bring a few outdoor chairs along on your adventures. There are a number of different chairs that are perfect for RVing, and the right one for you will depend on a number of different factors. Chair size, weight, comfort factor, and weight rating are all things to consider when selecting the right outdoor chair. Folding canvas chairs are a good choice for many RV'ers, because they are lightweight and take up very little room in your storage compartments. Folding chairs feature a durable canvas seating material and can be slid between other stored items very easily. Folding outdoor chairs are also great for the kids since they come in a variety of different sizes to match different body heights. One thing to consider with these chair are that they do not offer great support for those with back problems. And lower quality chairs tend to only have one or two seasons of use in them. Directors chairs are similar to the standard folding chair with their canvas seating material but are structurally more sturdy. Although they do not fold as compactly they do generally last longer and even have rocker options. Many of the outdoor director chairs offer a side table which makes eating around a campfire a little more convenient. If the park you’re staying at has picnic tables, you may want to have a few “bleacher seats” on hand. These chairs consist of a cushioned seat with a short back, and are designed to sit on top of a bench or set of bleachers. Many times the picnic tables provided at your campsite have seen better days and having a bleacher seat makes them usable. They also provide support for the spine, and are therefore ideal if you suffer from back problems of any kind. For something a bit more comfortable, look no further than a zero gravity recliner that allows you to kick back and rest your eyes under a shade tree during the afternoon or view the stars in the evening. With such features as padded armrest, a pillow for your head and neck and lock in place positioning, you will feel like your staying at a high end resort in this chair. These reclining chairs lay flat when folded but tend to be wide and can take up a quite a bit of storage space which is something to consider before purchasing. 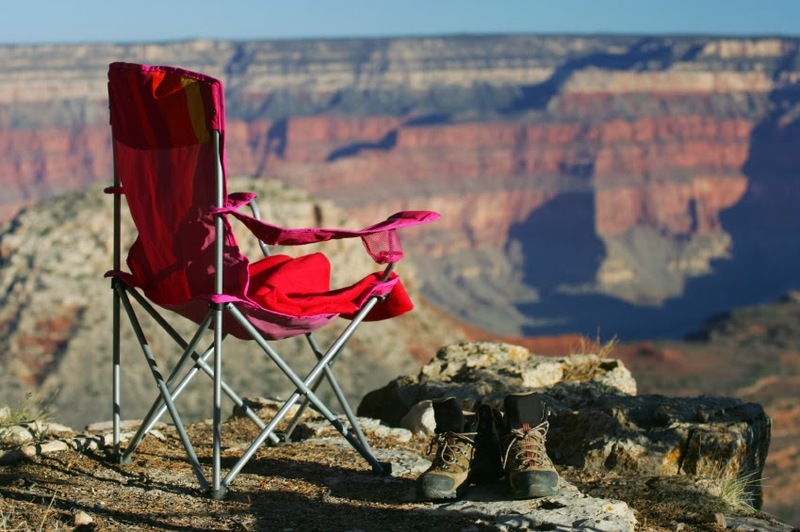 There’s no doubt that the right outdoor chair is essential for any trip in your RV. To find just the right chair for your next outing, visit our outdoor chair section on our website.